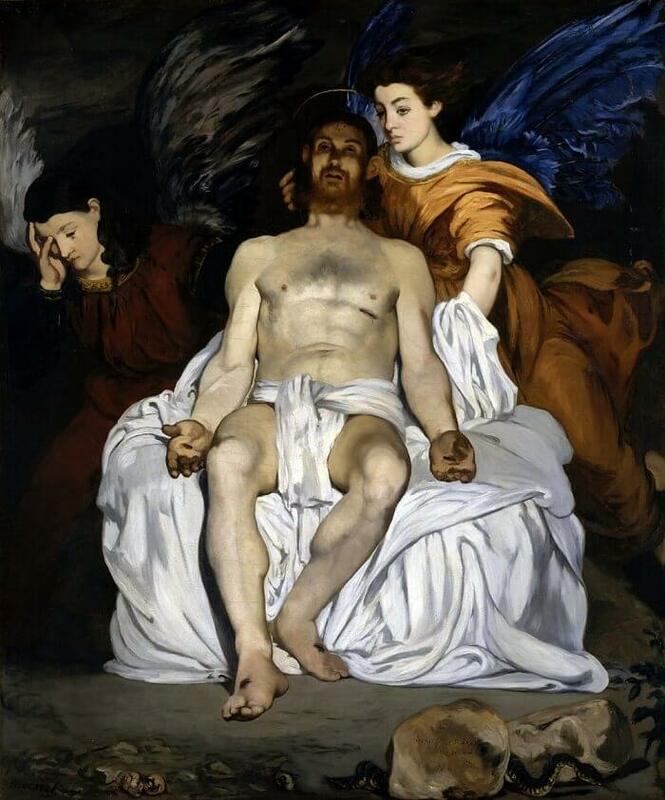 The Dead Christ with Angels, 1864 is one of the rare religious paintings by Manet and also one of the few produced in his period. 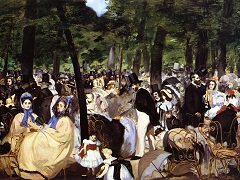 Although he did not attach much importance to the subject of his paintings, Manet one day remarked to Antonin Proust, "There is one thing that I have always wanted to do, and that is to paint a crucifixion. Christ on the cross - what a wonderful symbol! You can go on searching until the end of time, but you will never find anything like it." We do not know of any crucifixion by Manet, but he did paint this scene of Christ mourned by angels and also a Christ Scourged. 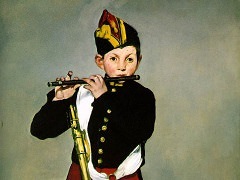 The picture is painted in a somber tonality of funereal blacks and whites, set off, in the Spanish manner, by browns and blues. 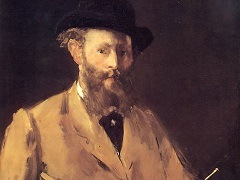 "By the way," wrote Baudelaire to Manet when the picture was to be exhibited in April 1864, "it seems that the spear was driven into the right side. 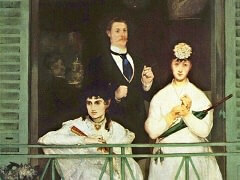 (Manet had painted the wound on the left.) You will have to change the place of the wound before the opening. Look it up in the Gospels and don't have malicious people making fun of you." There was no lack, however, of malicious tongues to say that the painting was a pastiche of Francisco Goya and El Greco. 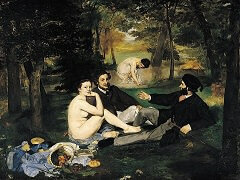 Manet was accused of painting "dirt." Even Theophile Gautier wrote in Le Moniteur of June 25 that "in this figure of Christ the pallor of death is smudged by dirty black shadows." 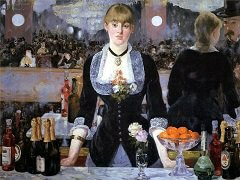 But a new champion of Manet, Emile Zola, was particularly attracted by this work, in which he found more death than life. "Were are told that this Christ is not a Christ," he wrote in La Revue du XIXe siecle, "and I admit that may be so. As far as I am concerned it is a corpse, painted boldly and vigorously, with the light full on it. 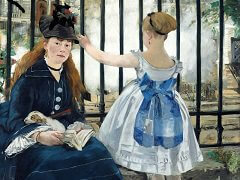 I even like the angels in the background - children with great blue wings."